Size: 10.1" x 3.2" x 3.6"
Battery Life: Up to 12 hours of continuous playback. Battery life will vary based on device settings, usage, and environmental factors. Actual results may vary. Warranty and Service: 12 months product warranty + 6 months extension after product registration, 24/7 technical support and friendly customer service. When connected to Wi-Fi you can access Alexa, you control with your voice. MD-3119 connects to the Alexa Voice Service to play music, make calls, send and receive messages, provide information, news, sports scores, weather, and more-instantly. All you have to do is ask. Just sign in to your customer account in the COWIN App to access personalized features and enable Alexa Skills. Step 2: Follow the instruction in the COWIN App and then connect to the Internet.Really easy to set up and use! Step 3: Pair multiple speakers for a whole-home audio experience,or tap and ask Alexa to play music, weather, news, and more. For additional instructions please refer to the user manual. If you have more than one COWIN MD-3119, you can control them at the same time through the COWIN App. You can let two MD-3119 speakers play together or switch from one to the other. Alexa Enabled: Just tap the voice button and connects to the Alexa Voice Service to play music, make calls, send and receive messages, provide information, news, sports scores, weather, and more-instantly. Two Wireless Modes: 9 hours playing time in WiFi mode, 12 hours playing time in bluetooth mode.Recommend to coneect to WiFi mode in indorr use, connect to bluetooth mode in outdoor use. 20W Powerful Speaker: Big size loudspeakers, 20W Output from Dual 10W Drivers.The bluetooth speaker features advanced DSP chips for adjusting EQ mode automatically according to different music style.Surround stereo sound easily fill a big room, and no distortion. 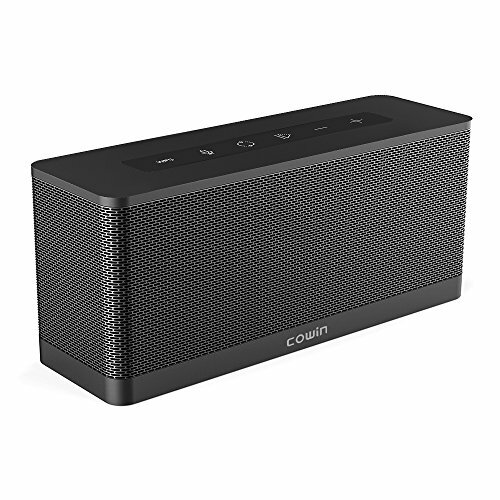 Multiroom Play: Using 2 or more cowin 3119 series speakers can build a multiroom to play different songs or the same song in different rooms. Can add up to 16 speakers at the same time. Online Streaming and Preset Chaneel: Unlimited online streaming services in the COWIN APP like Spotify certified, Tidal, Napster, TuneIn, iHeartRadio. Can preset up to 6 favorite channels.